Instead of using looong approach to open, read and parse XML, I prefer reading XML with Dataset and process as required. 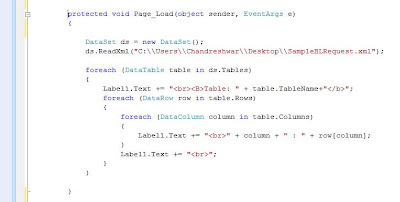 Reading through Dataset will load all data into DataTable and DataRow and can be parsed as reqd. Using the standard way to read XML (see other articles in blog for reading XML with recommended method) might be good, but remembering long and many lines of code to read and parse is again tedious.